The visit to Amarjit Sharma of Chaina village was to be a homage to a pioneer, who was the earliest convert to natural farming, whose success attracted worldwide attention and inspired many to make the change. But he had recently been bereaved. He sat sad-eyed and very silent. 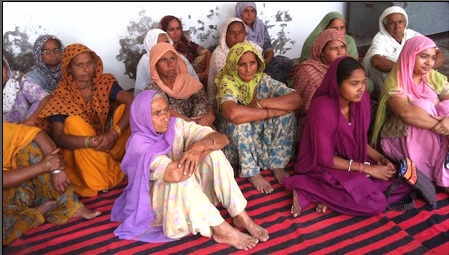 Handsome Punjabi faces in heavier sadness sat around him, heads bowed. "Amarjit is the single person around whom the fightback was built," says Umendra. "He is sage counsel, active worker and manager of a busy seed bank." Farmers from miles around milled about the front gate, to grieve for the much loved teacher. Amarjit's story and his importance is well told here. We are now driving across flat, vast country on fine roads. Canals criss-cross our path. And then very frequently we pass modern sheds with blue roofs and side cladding. They are Reverse Osmosis drinking water plants. A more damning admission of shame and failure by the government and society of a land blessed with rivers is harder to find. And worse, they are mere tokens. A villager would sooner die of thirst or cancer than reach these rare, far and few mechanical oases. The meeting in Kareerwali village is upbeat however. We sit in the silent, clean yard of the village Gurdwara. It's a meeting of some of Amanjot's flock. They have begun to grow vegetables for the family. They reminisce about old recipes. They talk of their grandparents who lived productive and fit, well into their nineties. Punjab's village streets are a series of tall, wide doors, always shut. But once you push past them and enter the invariably large courtyard you have entered the Punjabi's large warm heart itself. There is the mandatory tree with a rope-cot underneath. A couple of buffaloes are chomping fresh stalks. A tractor stands in a corner. A lady is manufacturing and piling up rotis on an open wood fire. Cattle dung buns have been patted onto hip-high rain shedding cones, where they dry and drop off. Their food is organic. It is only outside their gated yard that they spray and poison the fields; but alas, it penetrates their fortresses riding on the water they drink. But awareness is rising. They slap their foreheads in self-mockery. Change is afoot. Jaganmohan Singh of Kauni is nearly 7 feet tall and a journalist's nightmare: he barely talks or meets your eye. One can sense a quiet rage in him. The interpreter says he is angry with the seed and chemical companies -and the state as colluder- in enslaving India again. His family owns 38 acres and resists his passion for natural farming. Over the past 6 years he has converted 4 acres. He grows barley, pulses and wheat. It takes a little more labour but there is labour available in the village. He uses far less water, expenses are low and selling prices are high. The wheat is sold before it's unloaded in his yard. He gets thrice the market price for wheat and twice, for pulses. "With the stranglehold of the MNCs and our industry on the government and the farmers, do you really expect things will ever change?" If Jaganmohan is angry, Harjant Singh of Raike Kalan is saddened. "This Green Revolution has coarsened everyone. Farming was a spiritual practice: we offered prayers and thanks before sowing and harvesting. We respected the seasons and rains. If a peacock sauntered home, we ran to feed him. Now even rabbits have been killed off by chemicals. We used to be robust, caring, frugal community. Society has changed now. 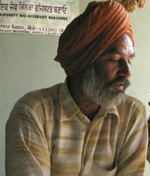 ["Samaj badal gaya"]. There is no sense of community, only a race for profits." He went on a tour of India searching for a lost culture. In Rajasthan he discovered large scale natural farming, practiced by Krishna Kumar Jakhar. He saw wheat, mustard, barley, grams, fodder and cotton grown there. 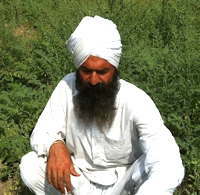 He realised from the working farm, that culture dictates and follows natural farming. Since 2002, he began to convert. Today, his entire 24 acres is organic. He met Umendra in 2003 during a campaign against Bt Cotton and has been the President of KVM. He believes the fightback is on. "Without spirituality, there can be no farming," he has concluded. Charanjit Singh Punni, 46 is an excited man. He was a journalist for the Spokesman magazine, who went to cover one of the seminars conducted by KVM. Umendra as is his wont, caught him in his dragnet and made him a keen activist. Charanjit had no interest in farming himself, until his brother Lakshman Singh died in an accident and the family wanted to sell the land. Today he is an enthusiastic natural farmer. He grows vegetables for the villages nearby and says he makes enough money. Starting in 2005, 2 of his 17 acres are now organic. He plans to steadily convert more as he goes. He can't believe the money he saves with his natural acres in contrast with the rest.